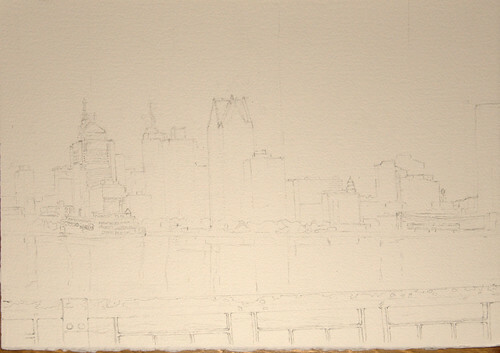 WIP Detroit Skyline, originally uploaded by photographerpainterprintmaker. We worked at Dieppe Park today. The sun elluded us, so it was difficult to see any values. I will return on a nicer day to paint this in watercolour. The size of this image is 28 x 38 1/2 cm. The Kiss, originally uploaded by photographerpainterprintmaker. The Leamington Marina was our original destination on Monday, June 6th, 2011. 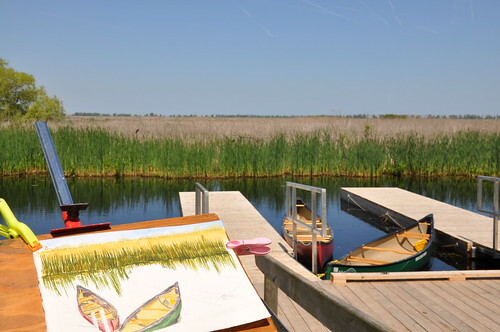 The Marina is a very pretty location, but sometimes pretty locations are not suitable for a painting. After about 1/2 hour searching for suitable subject matter, we decided to move on to Point Pelee, which is a few miles further down the road. It turned out to be a very good decision. We had the opposite dilemma at the point. 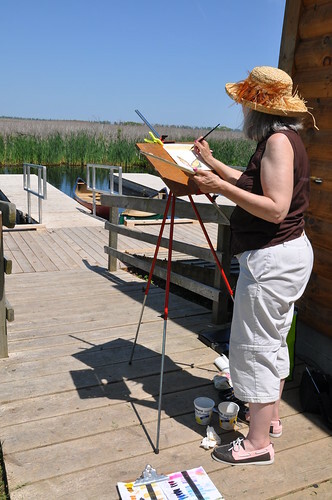 There were so many great compositions that is was difficult to decide which one to paint. I decided on the canoe’s. 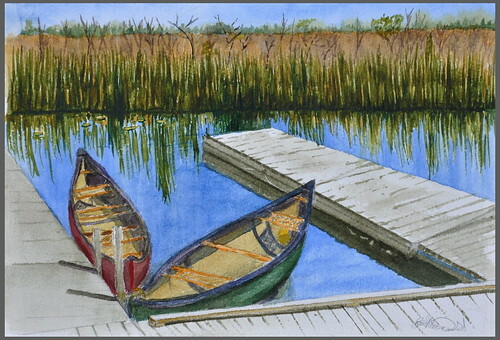 This turned out to be a great composition, but the canoe’s had a mind of their own. The staff have their orders and there is to be no fraternizing between canoes. One of them noticed that the green one had cut loose of its bindings, and was making out with the red one. So, she set about to lash it up to the other dock. “WAIT!” I exclaimed. She stopped dead and through my pleas she tied it up with the red canoe. The rest of the day they did the bump and grind to the slow ebb and flow of the marsh. The Kiss, work in progress, originally uploaded by photographerpainterprintmaker. The Kiss, in progress, originally uploaded by photographerpainterprintmaker.